Even though I have ridden motorcycles in my younger years (I am now 52) I quite riding when I was pregnant with my son and never gave it another thought till this past year. I happen to see a Vo-tech school in a neighboring town was offering Basic Motorcycle Riders Course. I took the course because I wanted to see if I could even handle a bike at my age, lol. I passed the course, got my license within a few weeks and my first bike within a month. My first one was a 2005 Suzuki 650SL. Being a big girl the fit just wasn't quite right. I saw the C50T at the dealers, took it for a spin and it was love at first ride! So much more comfortable and such a smoother ride, plus it had everything I knew I wanted on a bike. I absolutely LOVE this bike. It will definitely be around for awhile! I love your bike! 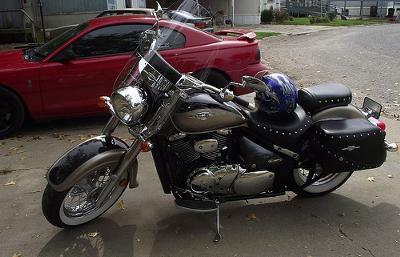 I have a 2006 Boulevard C50 and it is awesome! My friend has one exactly like yours and she LOVES it too. Have fun & ride safe! I have the same make and year model bike and I love it!!! I had it custom painted and it is gorgeous!!! Wish I could post a picture on here to show you!!! Your motorcycle course was the best thing you could have done!!! Ride safe!! !